Building on the success of the original Ultra Bar series of linear LED wash fixtures, we’re pleased to now be able to introduce the new and improved ADJ UB Series. Taking the same compact form as their predecessors, as well as inheriting all of their innovative features, the UB fixtures feature brighter LEDs as well as a hugely increased spectrum of colors. Comprising of three separate models, all of the UB Series fixtures utilize powerful 6-Watt HEX LEDs to produce potent washes of richly-saturated colored light. In addition to the red, blue and green of the original Ultra Bar fixtures, the new UB units integrate amber, white and UV elements. Mixing these six primary colors allows for a huge gamut of possible hues to be created, including warm and cool white, vibrant oranges, and UV-infused pinks and purples. All of the fixtures in the UB Series are supplied with mounting brackets which allow them to stand directly on the ground or be attached to a wall or ceiling. These brackets allow the fixture to be set at any angle and then locked securely in place using plastic thumbscrews. Alternatively, the brackets can be removed and the units can be placed directly on the floor for easy-to-setup wall washing. In this configuration, the fixtures also feature a patent-pending magnetic Quick Align end locking system which allows multiple units to be linked together to create a seamless output with no color breaks. At the top of the new UB range is the UB 12H, which is a 1-meter (41.75”) fixture featuring 12 equally-spaced HEX LEDs. Depending on the chosen DMX channel mode, the LEDs can be controlled as a single light-source or broken down into blocks of 2 LEDs to allow the creation of eye-candy chase effects. With a power draw of 43W, up to 13 UB 12H fixtures can be daisy-chained together to run from a single mains socket. Next in the UB Series is the UB 9H; this is also a 1-meter (41.75”) unit but featuring fewer LEDs (9 are spaced equally along its length), which means that it has a lower retail price. This model offers control of all its LEDs together or 3 independent blocks of 3 LEDs. It’s power draw is 35W, which means that up to 15 fixtures can be connected to a single mains supply. 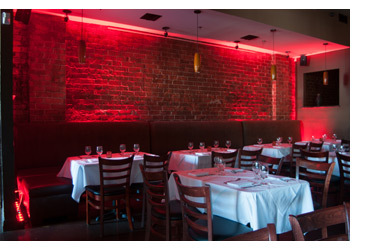 The UB range is rounded out by the UB 6H, a 0.5-meter (22.5”) fixture that utilizes 6 LEDs. This version offers control of all the LEDs as a single light-source, or 3 sections of 2 to match the UB 12H. 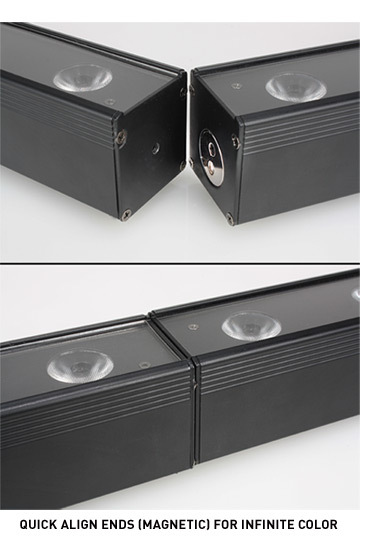 Its low power draw of just 30W means that up to 29 of the fixtures can be linked together from a single socket. Because the space between the end of each fixture and the first LED is half the distance between two LEDs, multiple fixtures of the same type can be joined together – using the Quick Align locking system – to create extended runs of LEDs that are perfectly spaced. What’s more, because the spacing of the LEDs on the UB 6H and UB 12H models are the same, these fixtures can be used together to create runs of any size in half-meter increments. Each offering a wide beam angle of 40-degrees, the UB Series fixtures are ideal for a variety of entertainment lighting applications. These powerful and flexible units are equally suited to illuminating performers on stage as they are to providing visual pattern effects. Similarly, they are perfect for up-lighting the walls of an event space and are also ideal for providing dynamic colored lighting effects on the dancefloor. All of the UB Series fixtures are built from metal and are finished with subtle black powder-coating. Their compact design (2.5” / 63mm wide x 3.5” / 90mm high) makes them easy to transport for mobile applications and convenient to conceal as part of permanent installations. They are also lightweight, with the 1-meter models coming in at 6 lbs. / 2.7kg. while the half-meter fixture is just 3.5lbs / 1.58kg. Demonstrating our commitment here at ADJ to making the life of our users as easy as possible, the UB Series fixtures all sport an intelligent design which makes setting up wall-washing systems as quick and easy as possible. The power and DMX input sockets are located at one end of the bar and the corresponding output sockets are at the other. This minimizes the length of cables required to link together multiple units, while also making setup easy as the output sockets of one fixture are positioned close to the input sockets of the next. As with most ADJ lighting equipment, the UB Series fixtures offer a variety of operating modes to suit various different applications. 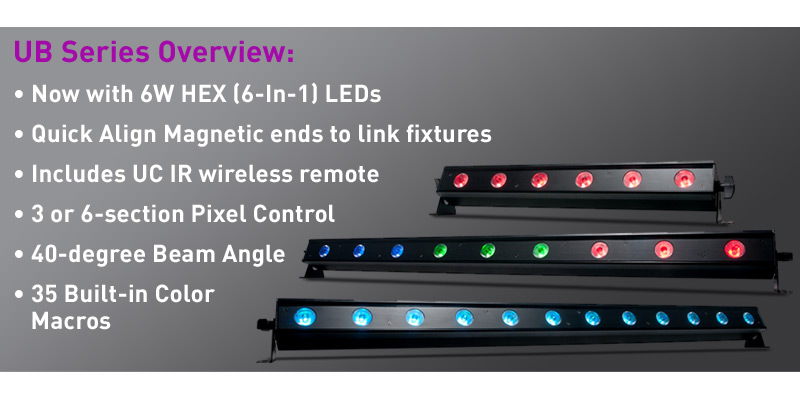 In addition to DMX control using an external controller connected via XLR, static colors can easily be selected directly from each fixture’s on-board LED menu display, using either pre-programmed macros or full RGBW+UV dimming. The units are also supplied with in-built chase patterns which can be set to run at a set speed or triggered by the beat of the music by an internal microphone. 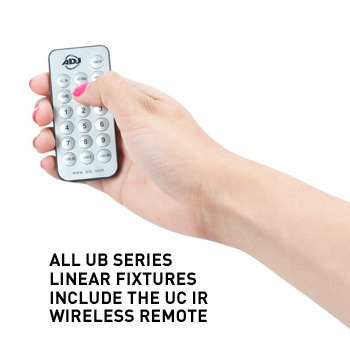 All of the UB Series fixtures are also provided, as standard, with a UC IR infrared wireless remote which can be used to select specific colors as well as access and control the units’ internal color chase patterns. Alternatively, each fixture is also supplied with an Airstream IR transmitter which can be connected to the headphone jack socket of an iOS device to allow control directly from ADJ’s free-to-download Airstream IR iOS app. Thanks to their powerful HEX LEDs, varied operating modes and flexible mounting options, the UB Series fixtures have the potential to transform any room into a venue of pure lighting excitement! If you’re looking for a linear LED fixture for a fixed installation or to enhance a mobile lighting rig, look no further than these three potent units.